This is the fourth installment of background for Tau Empire Alien Allies. We've already discussed the Kroot, vespids, and Gue'vesa which comprise by far the three most popular and most modeled races in the empire, but now it's time to look into the other races in the empire that have not yet been blessed with a model. This will entail all of the races mentioned in the official rulebooks and novels, and other GW sanctioned texts as being part of the Tau Empire, even if only in a sentence. That is not to say that there will not be articles here and there describing how to model some of these, and others. 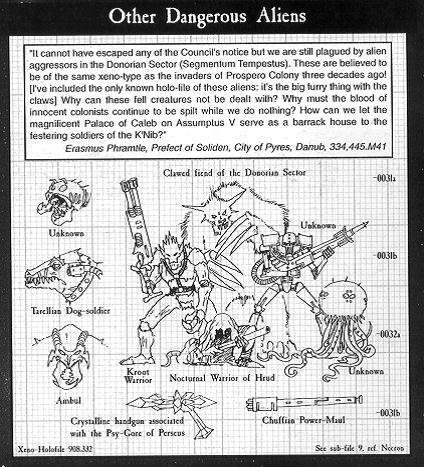 On the contrary, later this month I have a big article about how I have represented some of these, it is based an old fan codex that used Eldar rules to play third party models as allies in Apocolypse. On top of that, I intend post conversion guides for modeling Gue'vesa, some of the other races, and a race not listed here, Sebastian's Naga. But this article compiles all the background and everything I have been able to find about the sub-races in the empire. The Tau Empire covers vast expanses of Space, not so vast as the Imperium of Man, but it's still pretty big (if one can call the nothingness between the stars big...). Within that space there are many planets and races in addition to the Kroot and Vespids who have willingly joined the Tau, and many others that have been outright conquered, for the Greater Good -of course. Each alien race within the Tau Empire has a unique and different culture which either contributes to the Greater Good or supports it in its own way. However, all of the races hold to their common belief in the Greater Good that binds them together despite their cultural and physiological differences. But there are also other groups within the empire that are not necessarily members of it. Groups such as the non-aligned Kroot and Tarellians have no homeworlds to join the empire or be conquered by it. And many others like the Morallians have forsaken theirs. But for whatever reasons, the Tau have not seen fit to vanquish these peoples, but allow them to serve the empire as mercenaries or workers. Nicassar - the first alien race incorporated into the Tau Empire. Completely space-borne, as they are too weak and immobile to be of any use on land. Insatiably curious, they explore and scout star systems for the Tau. Even in space, they have poor offensive and defensive capabilities, nor do they possess any advanced economic infrastructure, because they hibernate whenever they are not actively exploring. They are also highly psychic, though the Tau try to keep this fact from the Imperium of Man, which seeks to stringently control psykers. Demiurg - The Demiurg are an avid mining species that has allied itself with the Tau. They are also expert traders who possess technology that is actually somewhat more advanced than that possessed by the Imperium of Man. It was actually the Demiurg who provided the Tau with Ion Cannon technology, which then became the mainstay armament used by all Tau ground forces, such as Fire Teams. The Demiurg are an entirely space-borne race which either lost or abandoned its homeworld, spreading out through the stars to mine new resources and trade. They help form a major component of the Tau Empire's interstellar economy. They are shorter than humans and have a sturdy build. The Demiurg are defensively hostile, but not aggressively militaristic, preferring to flee from stronger enemies and seek better trading opportunities elsewhere. As a result, they have generally avoided entering Imperial territory (unless they are invited in), and are thus rarely encountered by the Imperium of Man. This also means that they possess no starships designed for military purposes, and their preference for flight over fight means they do not use ground units. However, being equipped with advanced Demiurg technology such as powerful cutting lasers used for asteroid mining, even the humble mining ships of the Demiurg (such as the Bastion-class and massive Stronghold-class) are capable of successfully engaging Tyranid Hive Ships head-to-head. Ji'atrix - ethereal voidfarers, highly skilled at space-travel. The Ranghon are a race which has accepted the Greater Good and joined the Tau Empire. Non-aligned Kroot - Not all Kroot support the Tau interpretation of the Greater Good, and reject the alliance with the blue-skins. Many shapers see the best path for their kindred's genetic evolution to lay outside the Empire. Exiled from Pech, these bands wander the galaxy searching for prey that will some how contribute genetic advances to the Greater Good of the Kroot. The correct combination may earn them the right to return home. Unfortunately, these Kroot do not serve the Tau in any capacity, including as mercenaries, but they are perfectly willing to work for other races. 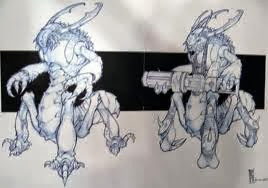 The limitation on their use is that while they have no reservations about killing and consuming Tau or Vespid flesh, they will not fight forces that include other Kroot. Morralian Deathsworn - The Morralians are auxiliaries that employ Deathsworn to the Tau. Tarellian Dog Soldiers - reptilian, dog-like aliens used as mercenaries. Possess a deep hatred of humans due to severe losses their homeworlds took in campaigns by the Imperium. 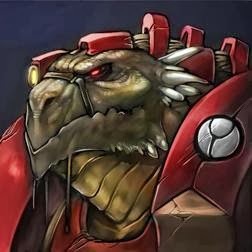 Commonly known in the Imperium of Man as Tarellian Dog-Soldiers because of their snouts and their preference for working as mercenaries for other alien races, are a minor reptilian species of xenos found throughout the galaxy, but are of little consequence to its affairs. They most often are encountered as mercenaries for the Tau Empire, particularly when Tau forces face the Imperium because of the Tarellians' ancient grudge against Mankind as a species. Hrenian - mercenaries, specializing in light infantry. 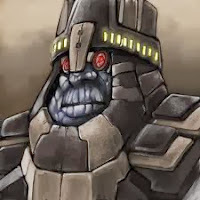 Anthrazods are a sturdy but dim-witted race well-suited to the Tau for asteroid mining. Brachyura are a small, dexterous multi-limbed crustacean race unparalleled in the construction of Earth Caste plasma generators. Nagi are a small but highly intelligent worms known for their mind control abilities. Poctroon were the first race to join the empire, but were wiped out by disease. Thraxians willingly joined the Empire. N'deemi are a race conquered by the Empire. Yep, that's about it. If you find another, please let us know and we will add it here. Keep your eyes open, you might be surprised what you stumble upon. The pic here is from what was once lot of GW concept art, and it just kind of slipped away. I think these old ideas were awesome... So let us know, even if it's just a snippet, just be sure to give credit where credit is due. As a final note, I think it is important to get a grasp on the fluff associated with your army. 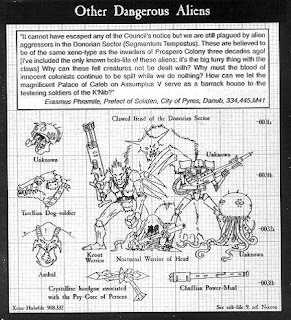 And there is still an unfulfilled rumor out there about two codex supplements in the works for the Tau Empire --one Kroot and the other is reportedly all about alien allies. Great list, I'd never heard of a lot of those. Hopefully a bit more of the spotlight falls on these other races at some point even if there aren't rules/models included. I agree. I am a huge fluff guy, and more about any of these guys is welcome. I searched dozens of sites and books, but this was literally all I could find out about them.